Rieth Recital Hall is about to host its sixth season of the Rieth Chamber Series, which features classical music performed by soloists and ensembles from all over the world. The series will begin on this Friday, Sept. 28 at 7:30 p.m. with The Donald Sinta Quartet. The Quartet is an all-male group of saxophonists named after their mentor, University of Michigan Saxophone Professor Donald Sinta. The Michigan-based group is notable for their ability to connect with new groups of listeners, and for their distinctive repertoire. The quartet also performs without the aid of sheet music and usually standing up, conventions which are intended to “strengthen an already palpable connection with its audiences,” according to their website. The Quartet are Gold Medal winners at the Fischoff Competition, which is the largest chamber music competition in the United States. They have won first place at numerous other competitions both nationally and internationally. The next performance of the series will take place on Sunday, Oct. 28. The Euclid Quartet, comprised of violinists Jameson Cooper of Great Britain and Brendan Shea of the United States, violist Luis Enrique Vargas of Venezuela, and cellist Jacqueline Choi of South Korea. The ensemble, formed in Ohio in 1998, is highly decorated both nationally and internationally. Craig Cramer, Professor of Organ and artist in residence at the University of Notre Dame, will come to the Recital Hall on Sunday, Jan. 20. He has performed across the country and internationally, and remains active as a traveling performer. Cramer was recently recognized at the University of Notre Dame with the distinguished faculty teaching award. On Friday, Jan. 25, GC will get a chance to hear a performance by some of its own. The Goshen College Faculty Trio is made up of Ukrainian violinist Solomia Soroka, Professor of Music, Associate Professor Jose Rocha, who conducts the GC Symphony Orchestra and Wind Symphony, and pianist Matthew Hill, Chair of the Music Department. A duo comprised of Sabrina Hu, flautist, and Cathal Breslin, pianist, will come to Rieth on Sunday, Feb. 10. Since 2001, the two have been performing together internationally and are responsible for the creation of the Walled City Music Festival in Northern Ireland, which has become one of the most successful festivals in Europe. 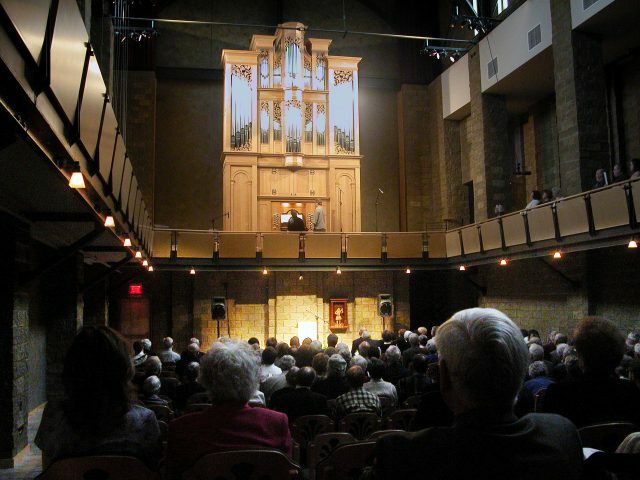 Sunday, March 17 will see a performance by international concert organist, recording artist, choral conductor and lecturer Gail Archer. Archer is the college organist at Vassar, and directs the music program at Barnard College, Columbia University. Norwegian bass-baritone Njål Sparbo will be returning to Goshen for the third time on Friday April 5. He will be joined by Norwegian pianist Einar Røttingen and other performers in an evening featuring vocal and chamber works by Edvard Grieg and other Norwegian composers. Series tickets are now available for purchase by downloading a form from the GC music center website, or by calling the Box Office by at (574) 535-7566. Subscribers receive a 10 percent discount on individually-priced tickets for the entire series.